Published October 30, 2017 at 1200 × 800 in Make a Difference Day brings together Flagstaff residents at Willow Bend. 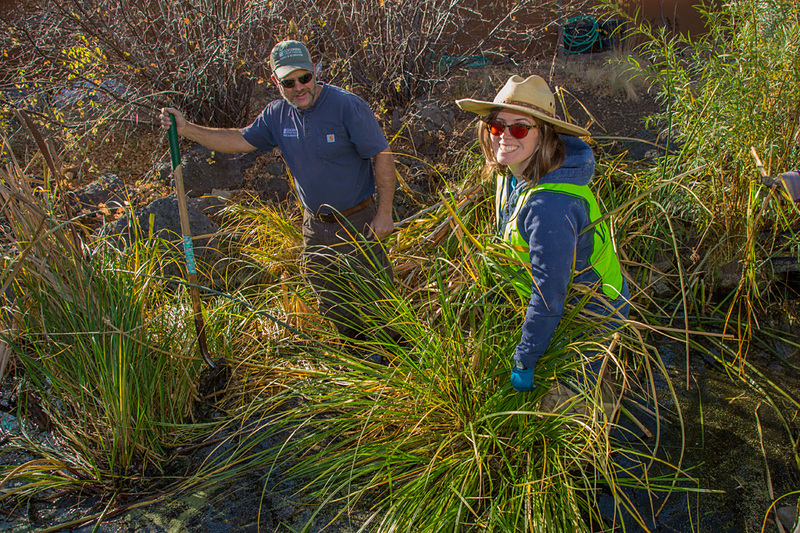 Geoffrey Gross, Natural Resource Supervisor for Coconino County Parks & Recreation, left, and McKenzie Jones with City of Flagstaff Sustainability Section, removing vegetation from pond outside the Willow Bend Environmental Education Center. On Make a Difference Day, Oct. 28, 2017, volunteers helped restore the habitat gardens at Willow Bend, stabilize and establish native vegetation on slopes, and clean up trash along the Rio de Flag below Sawmill Multicultural Art and Nature County Park at 703 E. Sawmill Road, Flagstaff, Arizona.